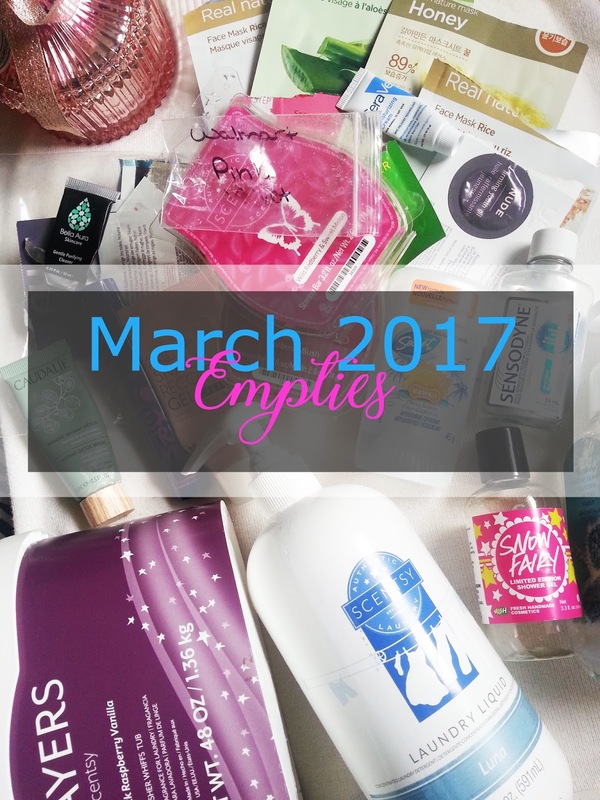 Deidre's Discoveries: March 2017 - Empties! I feel like I say this every month, but can you believe another month is done? It honestly feels like the time just flies by! I'm sure it also didn't help that I had that cold for just over 3 weeks. It finally is gone, and it felt like forever. Actually, I wouldn't say that it's 100% gone. Maybe 99%. But a ton better than before! Anyway, enough about my cold! Let's see what I managed to finish off in the month of March. 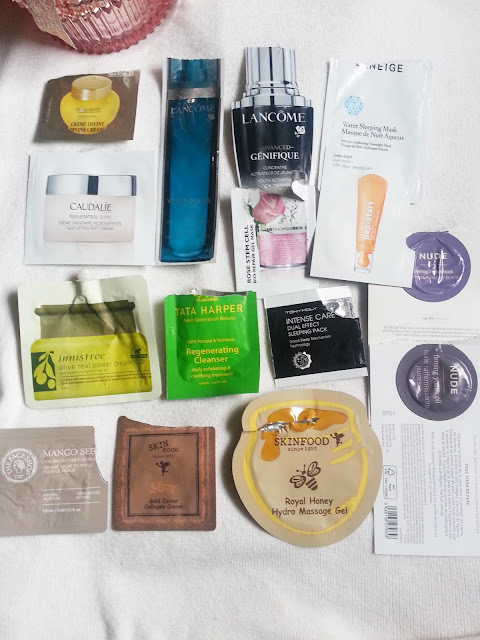 I just wanted to add here as well that I tried to focus on a lot of my skincare samples. I used to have a ton of them, and I began to send them with items that I sold online, just so I could clear some out. 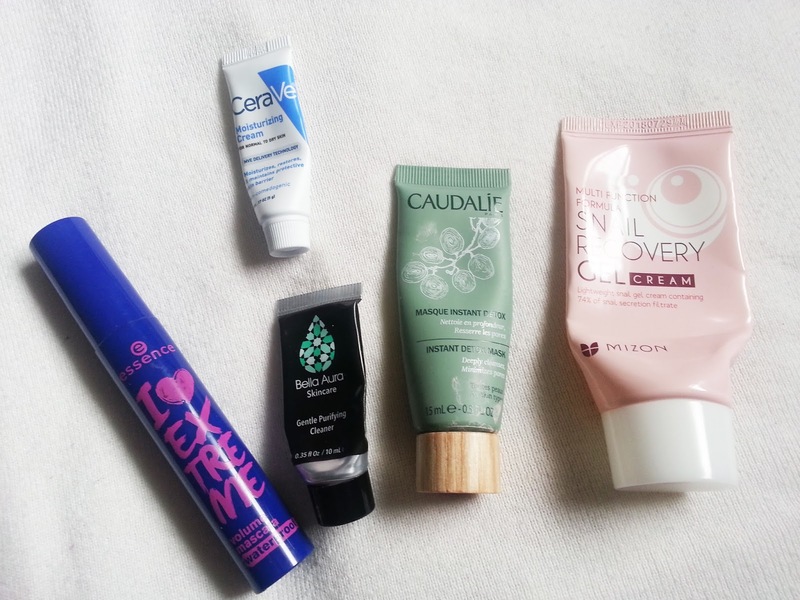 Whatever I used this month is pretty much everything I had left (foil packet) - I do have some cleansers that I need to use, but other than that, I've used up all my skincare foil packets! So, let's get into March 2017- Empties! I didn't use up as many full size products as I would have liked, but hopefully that just means I will finish more in April! Our laundry detergent leaves your clothes, towels and linens remarkably clean and infused with the perfect amount of Scentsy fragrance. White florals — jasmine, sweet pea, and freesia — juicy berries, and sandalwood shimmer like moonlight. Free of dyes and coloring agents; will not stain clothing, linens or towels. Luna is one of my favourite scents (White florals — jasmine, sweet pea, and freesia — juicy berries, and sandalwood shimmer like moonlight.) and it smells great on the clothing. I just found that it wasn't as strong as some other scents. If it lasted longer/was stronger, I'd definitely repurchase this again in this scent. It’s pure indulgence: fragrance for your clothes! 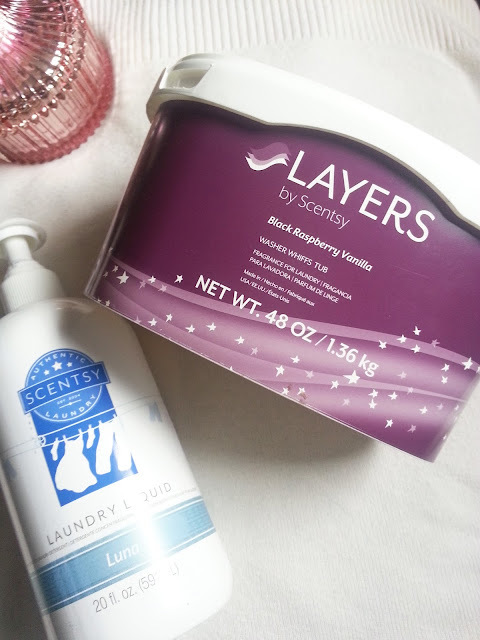 Add a scoop of WasherWhiffs to your washer drum and enhance your clothing with Scentsy fragrance. For best results, use with Laundry Liquid. Delicious, sun-sweetened dark berries warmed with vanilla. Easy to use — just add a scoop to your washer drum. Do you know what those Downy Unstoppables are? Well, these are pretty much those. You add them to your wash and they make your clothes smell great. Black Raspberry Vanilla is the strongest, and longest lasting scent for me. I've already repurchased another tub. This smelled great. It was kind of a mix of vanilla, and cotton candy, but kind of starburst candies too. So hard to describe. My friend actually sent me a cube when she sent the Girl Scout cookies, and I loved it. I'll have to see if we have this scent at Walmart here in Canada! 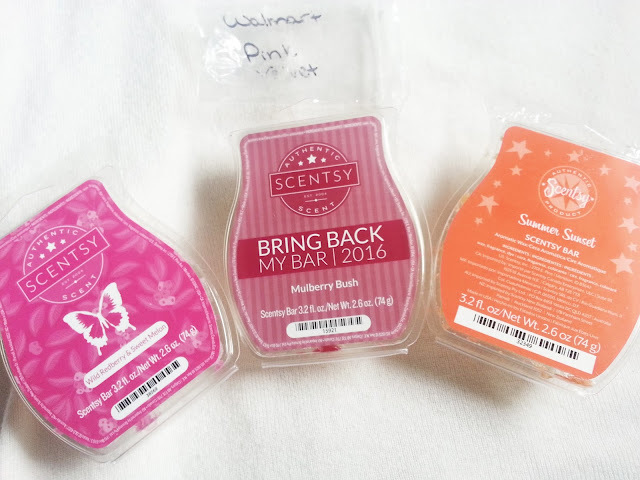 All three of these scents have been discontinued. Wild Redberry and Sweet Melon - melon, redberries and amber freshed up a classically fruity fragrance. Mulberry Bush - sweet mulberry accented with bittersweet orange peels. Summer Sunset - delight in the sun's last rays as brilliant pomegranate, black currant and rhubarb dissolve into a horizon of sugared lemon and vanilla frost. I wouldn't repurchase any of these three scents. They weren't terrible, but I have others that I prefer more. I'm trying to get my stash down. I say this as I have 6 new Spring and Summer scents on their way to me in the mail. This was sent as part of a sample source box I believe. I just got around to using it. I didn't find that it helped in making my teeth less sensitive, and it wasn't as minty as I would like. So I wouldn't repurchase a full size. I liked the scent of this, and I've grown to appreciate this gel over time. I used to hate gel deodorants, and then I was sent one from BzzAgent, and I really like them now. I like how fast they dry, and that they don't ruin my clothes as much as white stick deodorant. 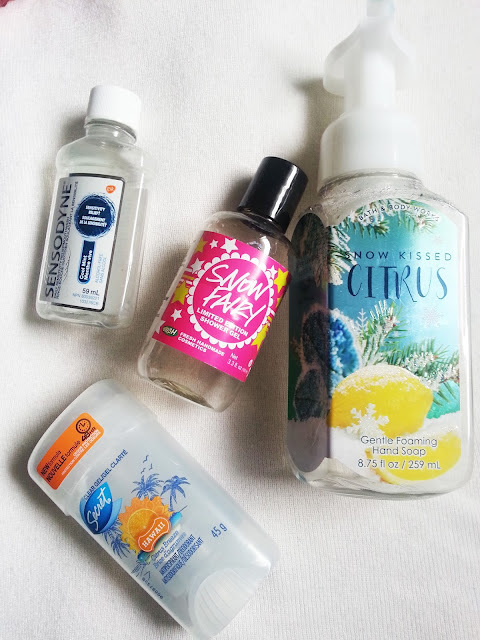 I have two other deodorants to get through first, and I will probably repurchase this when they're done! We all love snow fairy, do I even need to describe it at this point? lol. It's creamy, candy-vanilla. This bottle is actually from last winter, and I repurchased another in January during the BOGO sale. Love it! I love the foaming hand soaps, and this scent is citrus. I finished another bottle of this before, not too long ago. You'll see a few more of these foaming hand soaps in different scents throughout the next few months, because I purchased a ton when they were on sale in December. I liked this mascara when I first got it, but I found it dried out really quickly, and then began to clump my lashes. I didn't have issues with it flaking or smudging, but I didn't like how little time it lasted, and it didn't really give me as much volume as I was expecting. I'd pass on purchasing this again. This has such a large following on Reddit in the skincare sections, but I found that it did nothing for me. I didn't find it hydrated my skin much, and it kind of just sat on top of my skin instead of absorbing. And it did not do well under makeup. I would pass on purchasing a full size. Ugh. I hated the smell of this. It was also really watery, and perfumed. It didn't do well at removing left over makeup, and made my skin feel a little tight after using it. I would not purchase a full size. I didn't find that this did much for my skin, and often dried it out. It's also pricey for the full size. I wouldn't repurchase this. I didn't feel like this did much for my skin. I'd try and wear it under makeup and it would look patchy. On it's own, it would never be hydrating enough. So eventually to use it up, I would just apply it before my night cream as an extra layer. I wouldn't repurchase this. I'm not going to go into too much detail about these, just because there is so many, you'd be here all day! I'll do a quick little blurb. TheFaceShop - Mango Seed - Volume Butter For Face - loved this, very thick and hydrating, will consider repurchasing, sad I gave so many away! Peter Thomas Roth - Rose Stem Cell Bio-Repair Gel Mask - used this as a sleep mask. I really liked it. Hydrated the skin without being sticky. Could also be used as a wash off mask. 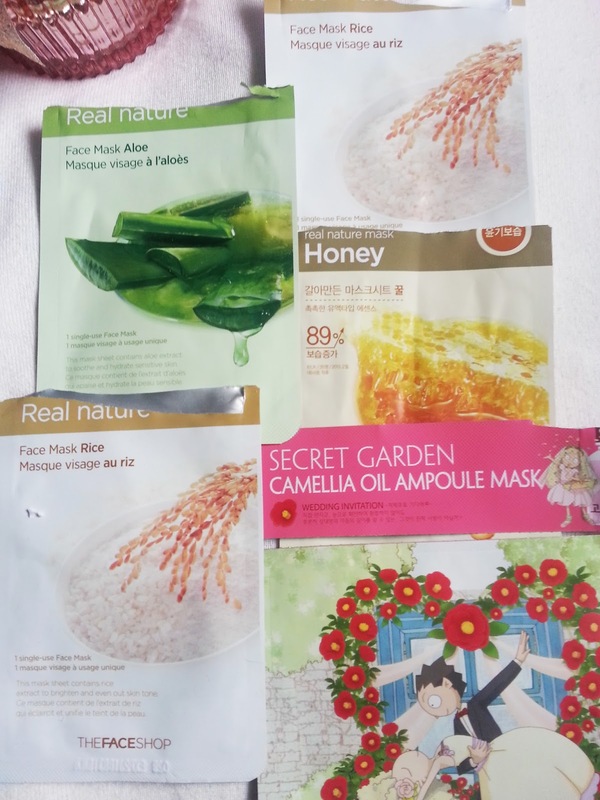 Of course, you see the Real Nature Rice mask in here. Does a quick job at making my skin feel hydrated. Honey is great as well. Aloe is good too, I didn't hate any of them. I really enjoyed the Secret Garden mask. You apply the ampoule first, and then the saturated mask. My skin felt great afterwards, I really need to research where to buy them. I used up only 5 sheet masks. Overall, I didn't use up as many things as I would have liked. Hopefully April will be better!